HH Sayyid Fahd then unveiled the plaque marking the opening of the Muscat Art House. 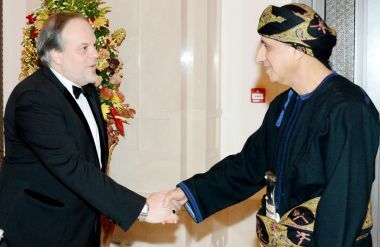 A music performance was staged on the House of Musical Arts stage in the presence of a number of officials, renowned figures from the Sultanate and a number of countries and diplomats. The music ceremony included a number of music performances from the Sultanate and the rest of the world. The Royal Oman Symphony Orchestra, Opera Singing Team and Hamasi Singing Team participated in the first part of the programme with a number of performances of which some were from the Omani art heritage. The second part included performances from the global opera masterpieces by the Czech National Symphony Orchestra with the participation of Nino Machaidze, the Georgian operatic soprano and Ramón Vargas, the Mexican operatic tenor. “The opening of the House of Musical Arts is an important event as it contributes to implementing the vision and care for arts and culture by His Majesty Sultan Qaboos. It is a new addition to the Royal Opera House Muscat which was opened eight years ago to promote arts and enhance cultural dialogue with countries that have rich art heritage in a bid to cement the art and culture cooperation with them, “ ROHM said in a statement. ROHM has contributed to showcasing the Sultanate’s ability to host art and culture events as per world-class standards. Since ROHM inception, a large number of opera performances and concerts from the world heritage were staged in it. ROHM also hosted many other cultural events that took into consideration the needs of the emerging generation. Since its launch and till date, the ROHM has achieved success thanks to the efforts it makes and the performances that have received recognition from everyone. The establishment of the House of Musical Arts complements ROHM through cultural exhibitions and lectures that cast light on the development of arts through ages. The House of Musical Arts, which is located behind ROHM across, exudes elegance and is a fusion of the architecture of the east and the west, and the traditional and modern. The building maintains the heritage architecture while adopting modern technologies — as is the case with ROHM in terms of wood, marble, designs inspired from Arabian patterns with Omani style as shown in the wooden door, aisles and the Islamic art inspired decorations. This ambience gives visitors feelings of warmth and happiness. The establishment of the House of Musical Arts aims at hosting more art and musical performances. It will support the cultural events and the opera performances. It will also host the suitable venue for a number of other events. The House of Musical Arts includes a stone courtyard surrounded with big arches and lobbies. The yard is designed to host off stage performances. The House of Musical Arts also includes a library, research archives, a cultural centre, permanent exhibition and the specialised areas for hosting the visiting exhibitions.